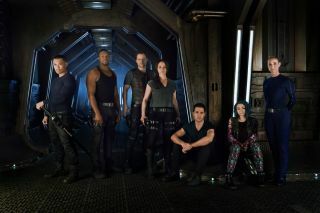 Space-adventure TV shows "Killjoys" and "Dark Matter" will return July 1, representatives for Syfy confirmed Friday. Both series are entering their second seasons. "Killjoys" will air first on Syfy, at 9 p.m. EDT (8 p.m. CDT) on July 1, followed by "Dark Matter" at 10 p.m. EDT (9 p.m. CDT). "Killjoys" follows a trio of space bounty hunters thrown into the middle of an interplanetary conflict within the four-body solar system known as "The Quad." Over the course of the 10-episode second season, the three will continue to solve the mysteries buried deep within their organization and struggle to find their place in the ongoing conflict. In the first season of "Dark Matter," six people woke up on a spaceship with no memories, and spent the season piecing together their origins and their mission. In the second season, which will stretch for 13 episodes, the crew will encounter more of the outside world and become embroiled in a vast conspiracy as they fight to survive. Both shows' science-fiction worlds blossomed over the course of their first seasons, and the second season should serve to deepen their scope and complexity now that the characters and setting are established. Syfy's space-bound epic "The Expanse" has also been renewed for a second season this year.